The Ellen's Creek Watershed Group is one of 32 organized watershed groups in Prince Edward Island. Its primary purpose is to restore and maintain the watershed area that drains into Ellen's Creek. A watershed is defined as an area of land that drains surface and ground water into the river or stream from the river’s mouth to its source. Ellen's Creek Watershed differs from most of the other watersheds in the province in that it is an urban watershed. As a result, many of the problems and issues for the watershed are a result of urban development that causes siltation. 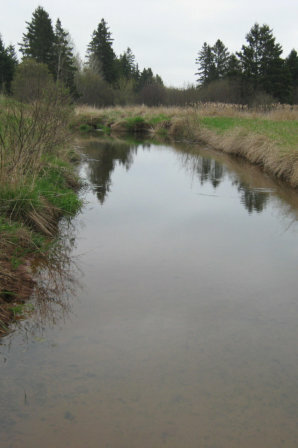 The Ellen’s Creek Watershed Group works with the City of Charlottetown towards development of a comprehensive city watershed plan and restoration of the three main watersheds within the city, Ellen’s Creek, Wright’s Creek and Hermitage Creek. The Board of the Ellen’s Creek Watershed Group meets on the first Thursday of every month (except July and August) at the West Royalty Community Centre. These are public meetings and everyone is invited to attend. Where did the name ‘Ellen’s Creek’ come from?